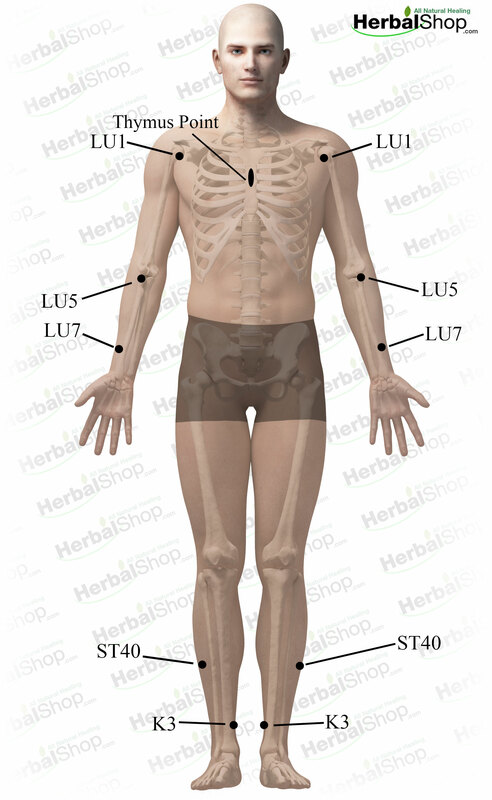 These are the acupressure points for bronchitis. Working on these points can help you get better faster. You do not have to use all of these points. Using just one or two of them whenever you have a free hand can be effective. Location: at apex of antitragus. 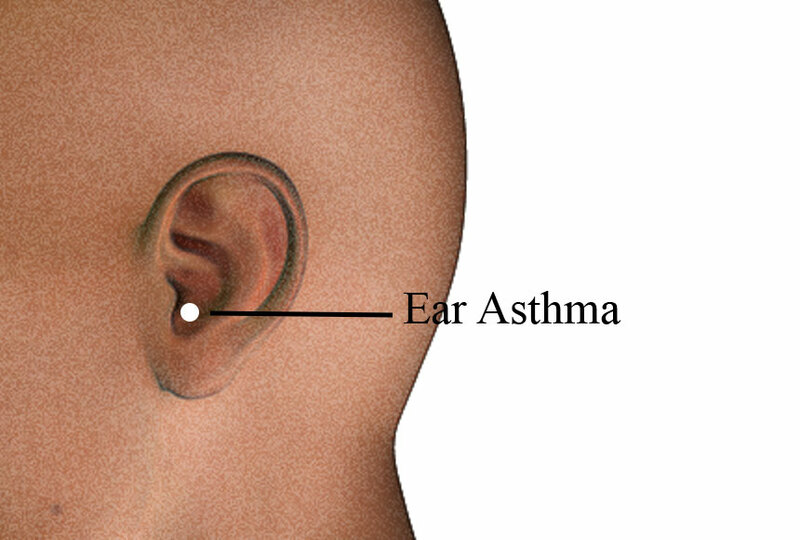 Benefits: asthma, bronchitis, and shortness of breath. Location: in the depression below the acromial extremity of the clavicle, 8 finger width lateral to the midline. On the outside edge of the rib cage, three finger-width below the clavicle. Benefits: shortness of breath, upper respiratory disorders, cough, asthma, pain in the chest, pain in the shoulder and back, fullness in the chest, bronchitis, pneumonia, postnasal drip. Location: On the side of the arm, one thumb-width away from the wrist crest. Benefits: headache, migraine, neck rigidity, cough, asthma, sore throat, facial paralysis, toothache, pain and weakness of the wrist. Location: 8 finger width above the lateral malleolus, two finger width lateral to the anterior crest of the tibia. Benefits: water retention, phlegm anywhere in the body, chest pain, asthma, excessive sputum, abscesses in the internal organs, sore throat, pain of the lower leg, headaches, dizziness, mental disorders, manic disorders, schizophrenia, depression, epilepsy. Location: in the depression between the medial malleolus and tendo-calcaneus, level withe tip of the medial malleolus. Benefits: balancing point, sore throat, toothache, deafness, hemoptysis, asthma, insomnia, impotence, frequency of urination, lower backache, swollen gums, palpitations, fear, emotions, anxiety attacks, vomiting, cold sores. “ever young point” to remove the age lines, to reduce the sensation of excessive heat or cold, side effects of radiation and chemotherapy. Location: on the cubital crease of the elbow, in the depression at the radial side of the tendon of biceps brachii. Benefits: dry cough, wet cough, fever, asthma, water retention in the lungs, sore throat, chest congestion, pain in the elbow and arm. Location: beginning from the lower border of the supraclavicular fossa and extends to the upper border of the xyphoid process of the sternum. Benefits: immune disorders, aids, low immunity, cancer, epstein-barr virus diseases, frequent colds, frequent viral infections, constant allergic reactions, long term sickness, chronic fatigue syndrome, blood disorders, leukemia, spleen disorders, platelet imbalance, immature blood cell production, bone marrow diseases. It is important to drink plenty of warm water after the massage, to help clear away toxic substances in our body. Caution: You should consult with a healthcare professional before practicing Acupressure or starting any diet, exercise, Chinese herbs or other supplementation programs. Hi, I'm Grace Chen. I’m enthusiastic about Traditional Chinese Medicine, natural healing including Chinese Medicinal Herbs, Acupressure, Qi-Gong, foot massage and more. My passion for herbs had been a lifelong journey beginning as a young girl always been fascinated by my grandfather’s Chinese Herbal Medicine chest, full of amazing goodies helping people get well. To chase my dreams, I created a website, HerbalShop.com to share my passion, my grandfather Dr. Chen’s herbal recipes, interesting new and the translation of the classical Chinese herbal formulas with the world. Hope you enjoy it! Click the arrow below to expand the list! How to Perform Foot Massage? Why Make Your Own Herbal Tinctures? We are passionate about Natural Healing and like to share our love for herbal remedies with you. We created a series of the Herbal Tincture Kits based on the classic Chinese Herbal Medicine used throughout the China for centuries. © 2003-2019 HerbalShop.com | We Believe In Natural Healing! | All rights reserved. This material may not be published, broadcast, rewritten or redistributed in any form. For educational purposes only. This information has not been evaluated by the Food and Drug Administration. This information is not intended to diagnose, treat, cure, or prevent any disease. If you have any health concerns, you should always check with your healthcare practitioner before self-administering herbs or self-healing programs.